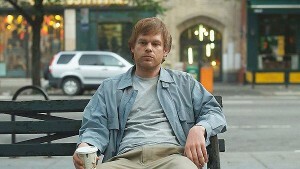 Michael C. Hall in "The Trouble With Bliss." ©7A Films. (Click on photo for hi-res version). 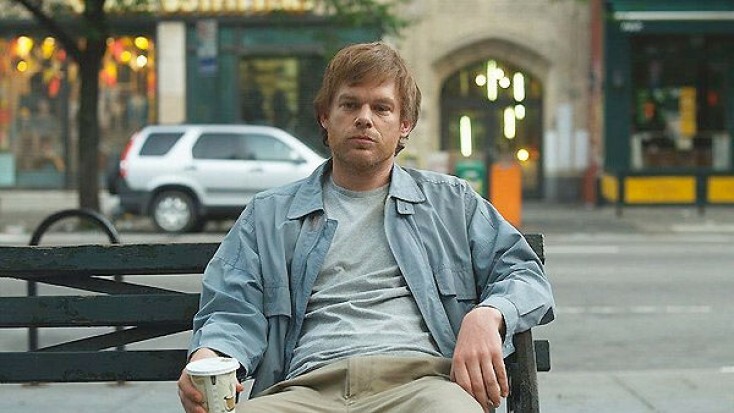 HOLLYWOOD—Michael C. Hall, best known as the blood-splatter expert who moonlights as a serial killer in Showtime’s “Dexter,” is a lot less motivated as the unemployed and unshaven Morris Bliss in the offbeat comedy “The Trouble With Bliss.” A 35-year-old who still lives with his disgusted dad (Peter Fonda) in Manhattan’s East Village, Morris is the half-awake center around which a quartet of quirkier characters revolves. Like Chance the gardener in “Being There,” life is what happens to Morris when he’s making no plans whatsoever. Chris Messina is Morris’ tall-tale-spinning buddy NJ, who has just left a fiancee at the altar. Lucy Liu is Andrea, a voraciously seductive neighbor who isn’t getting enough attention from her husband. Morris’ new girlfriend is the demandingly bossy and amusingly sarcastic Stephanie (Brie Larson), who says she is 18 even though she still wears a school uniform. And Brad William Henke is Steven “Jetski” Jouseski, one of Morris’ former high-school classmates who also happens to be Stephanie’s clueless and ridiculously friendly father. The very age-inappropriate affair between Stephanie and the wrapped-around-her-finger Morris is the most consistently enjoyable part of the movie. Larson is excellent at giving Stephanie a combination of self-centered immaturity and smartass cynicism that’s completely convincing. Stephanie states with deadpan authority that rats are “worse than horny cousins, the way you’ve got to fight them off,” and her life’s goal is to own a Subway sandwich shop. It may be hard to believe that such a vivacious young beauty would find the more than twice her age and mopey Morris irresistible, even if Woody Allen was able to make the same idea work in “Manhattan,” but their chemistry definitely is entertaining. The other three even less likely plots are not as satisfying partly because they feel padded out. Morris hasn’t seen Jetski for so long that he only vaguely remembers who he is when Stephanie identifies him as her father. When Morris and Jetski accidentally bump into each other later, Morris naturally is afraid of the consequences if Jetski realizes who his daughter’s new boyfriend is. But the unanticipated one-sided bonding that occurs when the overly affable Jetski enlists Morris to go undercover and help eject squatters from a building is so awkward it seems badly improvised. Morris’ encounters with NJ, which primarily involve sitting on a bar stool listening to him spin unlikely stories, could have been cut. And while the Morris-Stephanie relationship is absurd enough to work, Andrea’s attraction to Morris seems forced and a little redundant. Granted, she “doesn’t want to turn into a shabby sofa” by being regarded as a piece of furniture by hubby and craves a little appreciation. But Morris looks like he sleeps in his clothes precisely because he does, which wouldn’t make him any woman’s go-to guy for adulterous amour. Adapted by director Michael Knowles from co-screenwriter Douglas Light’s 2007 novel “East Fifth Bliss,” the story is set in an indeterminate but presumably contemporary time period. Morris has a cell phone, but we never see him online, which would seem to be an obvious refuge for someone who spends so much time in his small bedroom. Even if three of the four main plotlines in “The Trouble With Bliss” don’t quite work, the “Manhattan”-lite one that does is worth taking the trouble to see.